CO2 Indicators are intended to be used in conjunction with carbon dioxide generating systems used for the growth of bacterial cultures. The CO2 Indicator signify that the carbon dioxide concentration in the atmosphere is 3% or greater in jar or pouch incubation systems. 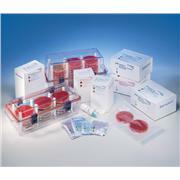 …with white polypropylene liner less screw closures. 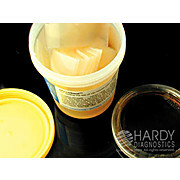 Store pastes, samples, powders, specimens etc. 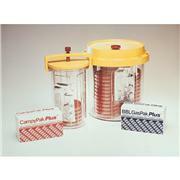 in industrial and lab applications. PETE is durable, shatterproof and has excellent gas barrier properties with H20, O2 and CO2. 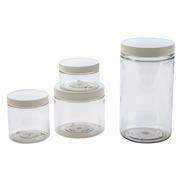 These jars may be used below freezing to a maximum of 70°C. …seal around the perimeter of the plate and let it remain at room temperature for about an hour. The seal will then dry and shrink to fit tightly, while maintaining permeability to CO2 and O2. Seal can be easily cut if removal is desired. For 15x100mm plates. Seals are transparent. 60 seals per jar.